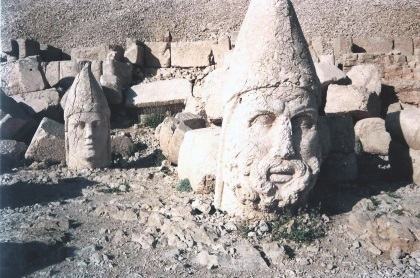 Nemrut Dag comprises the Hellenistic mausoleum of Antiochus. In the first century BC, the Roman-Persian king Antiochus I of Commagene (a kingdom north of Syria and the Euphrates) ordered to build a grave and temples on this site. On two sides of the mountaintop terraces were set up for meters high statues of the gods and himself. The statues represent a.o. Apollo, Fortuna, Heracles and Zeus. The heads of the statues have tumbled down in the course of years, and have been erected again on the place they fell. They are all about 2 meters high. It is suspected that the grave of Antiochus himself is hidden under the mountaintop, beneath a heavy layer of debris. The most beautiful places always seem to be the most remote. 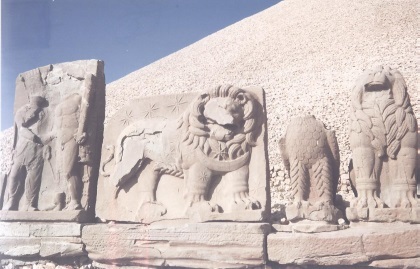 Nemrut Dag is a good example for this theory. It is situated near the little town of Kahta, deep in the heart of Turkey. From there you have to drive 1,5 hour by jeep through inhospitable surroundings. Finally a half hour-climb of the mountain itself awaits you, before you can see the magic sight with your own eyes. We reached the summit as dawn broke and wirnessed the amazing mountain range;Nemrod Dag's large stone structures.On returning I was invited to a Kurdish village.An experience never to forget. Read more from joan Stribling de Launay here. We mounted donkeys and rode to the top to find the awesome heads and enormous still standing stone bodies. A German Archeologist was there. He had covered many of the heads with rocks, but removed some for us so we could view them. We were invited for lunch ,out of guilt perhaps, and had the most delicious yogurt I have ever encountered. We came from Diyarbakir via Siverek by public bus, the shortest and most scenic way to Nemrut Dagi is to take the short ferry boat ride across the Atatuerk dam, there is a minibus from Severik downtown opp Kiler supermarket.8TL leaves hourly. A convenient place to stay is Karadut.If you call the owner of the pension house, they pick you up at the main road. We have choosen a sunset visit to the Mt. Nemrut and the East terrace was already without much sunlight.But the athmosphere and the huge statues on top of this sacred mountain were so unique and well worth all efforts. i drove to the foothills in a Citroen Ami in 1977 I was taken ,by jeep, up to the top of this 9.000ft.mountain and saw dawn break. A truely memorable experience.I was then invited around a nearby village to draw and take photographs. Went there in 1987 as an 18 year old. Didn't really know what to expect and didn't really understand what it was when I got there. We didn't have the internet back then. I remember that it was fantastic and fantastically remote. We travelled for hours along an unmade road in a dolmus/minibus full of goats and chickens. I kept falling asleep on an old lady's shoulder and may have dribbled on her, but she was too polite to complain. We spent the night on the mountain top under the stars. It was freezing, but worth it for the sunrise. Hope it is still the same. I cycled up there in 1988 - 21 years ago!!!. It took all day. I remember being knackered by the time I reached the top, but it was well worth the effort. I camped up there overnight and was rewarded with a spectacular sunrise the following morning. As you go down the highway to approach the town of Kahta you can see a mountain peak that looks very diffrent from the others. This is Nemrut Dag. As others have said there is long ride up through the awesome mountains to get there. There is a steep walk to go from the car park to the ruins. Due to the altitude it is much colder at the summit than where you started from, even on a warm sunny day - be prepared. The beheaded figures, their propped up heads, and the altar on the eastern side are the most dramatic. Nothing else anywhere can compare to this bizarre site. There are magnificent views of the mountains and the waters of the dammed Euphrates River. There are more remains of figures, including some of the best 'heads', on the western side. What isn't often mentioned are the sculptured slabs that are also part of the site. At the center of this place is the large tumulus of pebbles that is probably the tomb for which all this was built. While visiting think about all the labor needed to bring the marble for the figures and the stone pebbles up to this remote place. Hard to get to, pretty much must hire a guide. Stayed in Kahta; had a chance to visit with a Kurdish family while we were there. Well worth the trip out there; Due to the altitude, it is cold, take a jacket. It is a fantastic place. It is a long journey but as you climb your soul and your eyes will be highly rewarded. It one most inspiring places in the world, ahead of other World Heritage Sites. If you have time, go. You won't be disappointing. I and a small group of USAF friends took the time to visit Nemrut while we were staying in Diyarbakir. The drive was long, winding, and rough. There's a small hotel down the mountain--for those who want to really spend some time there. On the way up there is a carving of Antiochus shaking hands with Hercules (sort of a hero endorsement I guess). I made the mistake of wearing slick-soled cowboy boots. We met only a single other explorer, a German, who was on his way down. He looked at my boots with amusement. The climb was easy--more of an uphill walk--but I have a fear of heights and so I was uncomfortable. This was in March. The sky was overcast. As we reached the top, it started to rain cold drops which soon turned to ice/snow. Our time was cut short, but I remember thinking that the religious fanatics who toppled and damaged the statues were at least not lazy. I wish a reconstruction could be attempted before long. I'd like to see things as they were intended, even if some pieces have to be remanufactured. Don't get me started on the Venus de Milo's arms! tes it was very awe inspiring. We had driven up the back road to the top of the hill. the driver of our van was overcome by the height and the fear as he drove over the rough road and spent his time there lying on the ground feeling ill.
My companions and I walked around as we read from our guide books identifying all the statues. of course we took plenty of photos both of the remains and the view. It was easy to see why anyone would want to build a temple/burial site at this place. It was so isolated!!!! We were the only people there and enjoyed the peace and mystery of the ruins. We traveled up the treacherous road to the top of the windy mountain as it neared evening. As we pulled to the top of the hill, the sun was just setting behind the mountains, making the sky a brilliant orange. The kurdish ranger allowed us to pitch our tent on the top of the mountian, and he entertained us long into the night with his talk of multiple wives. Just as we were settling down for the night, a group of Turks settled right next to us, and with their loud banter kept us awake all night. We got up at the wee hours of the morning in the frigid air to watch the sunrise. The Euphrates sparkled below as the statues of kings and eagles gave a mystical aura to the view. All at once I felt a sort of awe for the relics that connected that age to ours. Mt. Nimrod was far from dissapointing, it was inspiring. 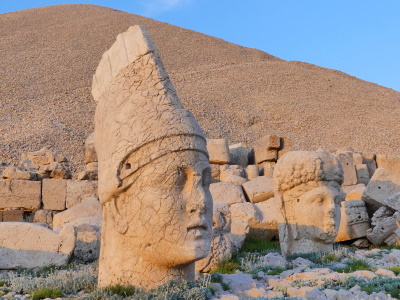 Individual Mountains: Turkish for "Mount Nemrut" (or Nimrod). Mt Nimrod is a 2134m mountain at the summit of which is a historical site which was nominated as " The Hierotheseion of Antiochos I of Commagene on Nemrut Dag"